This Christmas, show your love and appreciation for the special people in your life. Whether it’s your fiancé, wife, mom or best friend, a beautiful piece of jewelry makes for an unforgettable gift. Right now, Blue Nile is throwing a 50% sale for the Christmas season. You can see a list of the items on sale here. Our Christmas gift guide below includes bracelets, pendants, earrings and rings from highly recommended vendors. Look through the suggestions to see what matches your loved ones’ personalities the best. Most importantly, we recommend purchasing your Christmas jewelry from a reputable vendor. For colored gemstone jewelry, consider Blue Nile, Leibish & Co. and James Allen. For diamond jewelry, choose Blue Nile, James Allen, or Brian Gavin. Finding a meaningful Christmas gift is well worth the effort. Rather than a gift that they’ll forget in a year, a piece of jewelry will be remembered and cherished for years to come. When selecting jewelry for a loved one, take into account their personal style. Do you often see them with a colorful necklace or a pair of dangly earrings? Do they prefer bracelets or pendants? Choose something unique to make them feel extra special. Our guide includes over 40 jewelry gift ideas for Christmas. For mom, grandma or your girlfriend, choose jewelry that will become a keepsake. From necklaces to bracelets, there’s something here for every style. An extra perk of buying online? Avoiding the holiday crowds and busy shopping centers. Diamond jewelry is a stunning, timeless gift that can be fashioned with any type of precious metal. Look through the suggestions below to choose a design that matches the style and personality of the special people on your Christmas list. Give the gift that can be worn with almost any outfit: a diamond bracelet. 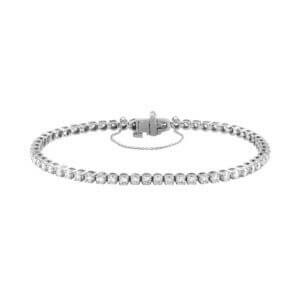 Consider a tennis bracelet with 54 diamonds or a bar bracelet with 13 diamonds. Know what else wraps nicely under the tree? Tennis bracelets. They’re elegant, timeless and incredibly beautiful. From studs to hoops, plenty of earring options are available. The best part about diamond earrings is that they can be worn with outfits on many festive occasions, such as an upcoming New Year’s party or graduation. The earrings we suggest are from the best diamond vendors in the industry. Their jewelry and settings are made with precision and care. A diamond pendant is special because it’s worn close to the heart. Whether it’s for your daughter or wife, she’ll cherish this timeless piece of jewelry. Consider a heart pendant or a six prong pendant like this 14K white gold necklace. These pendants are designed to allow maximum light to pass through the diamond, providing plenty of brilliance and sparkle. For a full jewelry ensemble, build a set of complementary earrings. Diamond rings aren’t just for engagement. They make stunning gifts for other celebrations too, like Christmas. With styles like a unique halo ring and a twist diamond eternity band, your gift is likely to become a keepsake. Want a unique, colorful alternative to a diamond? Opt for a gemstone like an opal, ruby or sapphire. Gemstones are eye-catching and often cost less than diamonds. Consider his or her birthstone, or their favorite color when designing a truly personalized piece of jewelry. Add color to her wrist with a sparkly gemstone bracelet. Choose a single gemstone or a multi-colored design like this round rope bracelet. Bracelets can be made with almost every gemstone—from emeralds to sapphires. Colored gemstones earrings are bound to draw attention. The vivid colors add character and personality to any outfit. Styles and shapes for earrings vary greatly, from topaz drop earrings to magnolia ruby earrings. You can even design your own studs with James Allen. Colorful pendants are standouts in the world of Christmas gifts. Whether it’s a sapphire solitaire pendant or a ruby drop pendant, it will steal the show with its remarkable color. Choose a simple style like this aquamarine cushion cut pendant or this sapphire solitaire pendant. Or select a design that’s more intricate like an amethyst halo pendant. Any ring, especially a colored gemstone ring, represents passion and beauty. Design one that will make him or her feel extra special. Choose a birthstone or favorite color to create your rings, like this amethyst and diamond halo ring. The most important recommendation we can give you for purchasing Christmas gifts is to choose a highly reputable vendor. Rather ending up with jewelry that’s of inferior quality, you’ll have a piece that’s high-quality and can last for generations. The vendors below offer beautiful diamond and gemstone options at excellent prices. Our years of experience in the industry have given us a consistent pulse on which vendors you can trust. All jewelry is made with high-quality metal and stones. Not only will you end up with beautiful, durable jewelry, but you’ll get it at an excellent price, too. Many jewelers, like Jared and Kay Jewelers, offer seemingly great gifts for holidays like Christmas. Their advertisements target a particular line of jewelry or even specific items. While these companies may seem reliable, the jewelry is often poorly made. In other words, you’ll purchase substandard jewelry that won’t maintain its beauty or value. Although the price tag is tempting, you’re not getting nearly the value of what you’re paying. That’s why we recommend only choosing high-quality jewelry from reputable vendors (see our list above). By purchasing something from a trusted vendor, you’ll give a remarkable and lasting Christmas gift. No matter which pendant, ring or bracelet you put under the tree, know that a thoughtful gift is what matters most. Jewelry gifts represent love, care and appreciation. And your loved one will think of you every time they wear it. For assistance in choosing diamond or gemstone jewelry, email our experts.